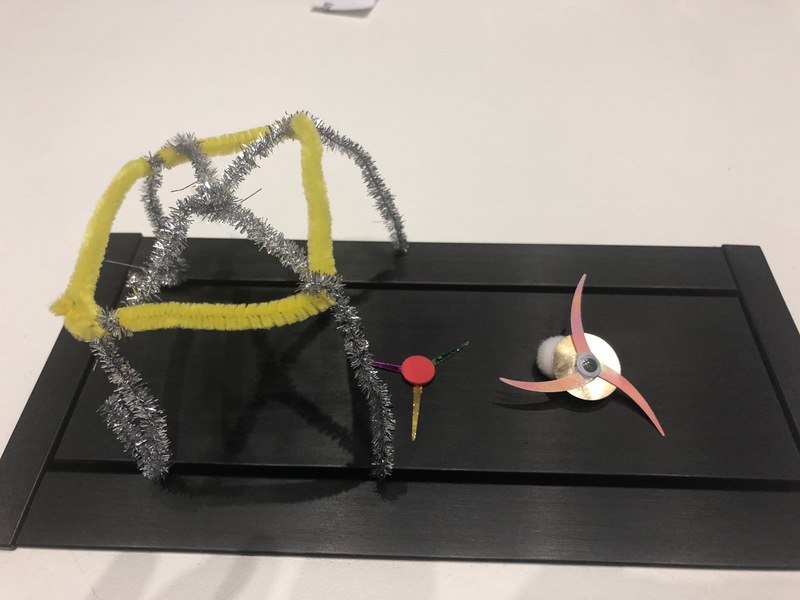 How to facilitate a 1-hour design thinking crash course for teachers (and reimagine drones for peace) – Let's design a better future, together. In March, MOD. launched a school program for its second exhibition, Waging Peace. The program invites schools, in South Australia and beyond, to design and/or build peace machines for display as part of the exhibition. MOD. strives to encourage young people (specifically aged 15 – 25) to establish both a cultural and professional connection with science, technology, engineering and maths. This project was designed to spark that interest in the classroom, using a design-led approach to consider technology for peace. To kickstart the program and to inspire the teacher’s that would lead students through the process, MOD. ran a professional development session in May 2018. The team wanted to include some training on design thinking as part of the workshop – when I heard this I initially argued against it. 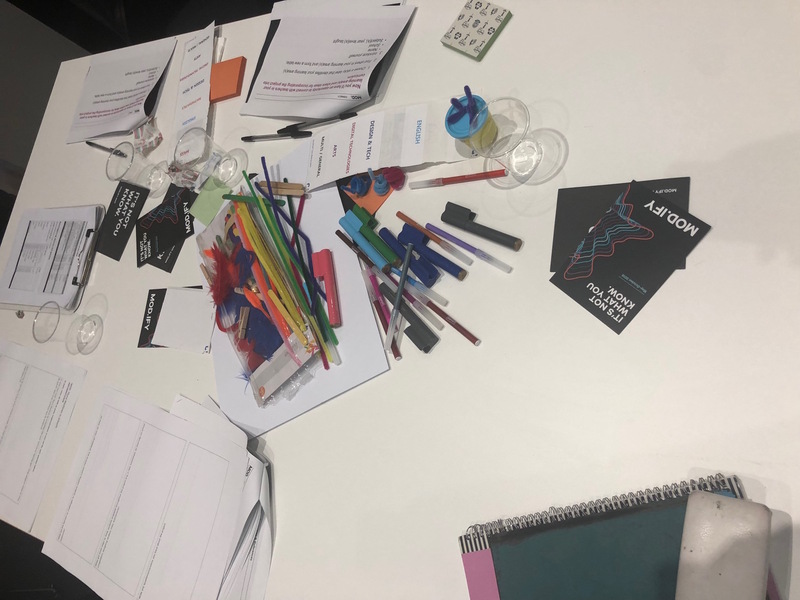 The idea of finding a meaningful way to lead 36 teachers through an interactive workshop and teach them design thinking in a way that supported the complex themes of the Waging Peace exhibition in just one hour seemed like a challenge too far. But, as a designer, I know that with challenge comes opportunity. As I mulled over it a bit more I knew it was an itch I wanted to scratch. I wanted to find out whether it could work. Would people gain value from it? Or would it end in disaster? Plus, I knew that I was about to leave MOD. at the end of May to move to the UK – what could be better as a last hurrah? I ran the workshop on 23 May and surprised even myself. It can be done, people enjoyed it and I learnt a lot about facilitating it in the process. Here are six things that helped make it a success as well as some of the areas I had to let go of to make it work. One of my first (and most important) decisions was what to make the design challenge about. Most of the short, crash courses in design thinking I was aware of have used a hypothetical example to get people thinking about empathy, ideas and prototyping (for example, d.School’s Gift-Giving or Wallet Projects or Tom Wujec’s Marshmallow Challenge). These projects offered existing facilitation tool kits and therefore an easy way forward. However, I was trying to get teacher’s thinking about a very specific design challenge: How might we build a machine for peace? As the daughter of two teachers I know they are very busy people and I didn’t want to hand them the burden of reworking something like the purse project for their own classrooms. I felt it was important that I picked a challenge that was much more closely aligned with the one they would soon tackle with their students. But asking someone to design a peace machine in an hour is also tricky. To start with, ‘peace’ is a very loaded term that always generates conversation and debate and is tricky for people to get their head around. To make matters worse, what constitutes a ‘machine’ is often broad, subjective and ambiguous. I’d already had looks of confusion in conversations around this idea and I knew that a design challenge left that open might chew up the whole hour just in a discussion of what the challenge was. So, I decided to pick one machine and reimagine it. I chose drones. Drones offered a number of specific opportunities. 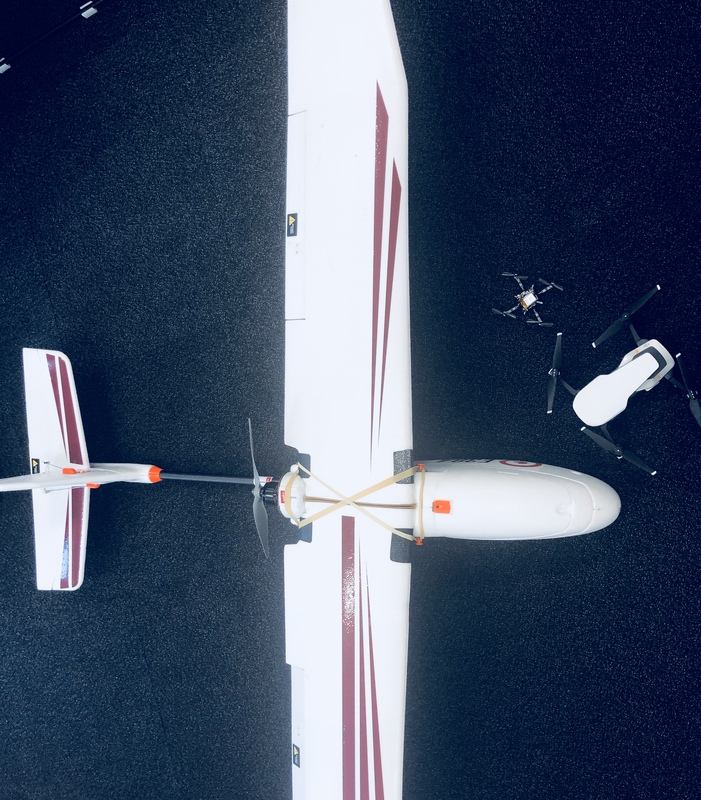 Firstly, they are a machine that is relatively easy to understand – most people know the basics of how they behave (they fly, land, take off) and what they do (surveying, mapping, reconnaissance). Because of this, drones were an good way to keep the idea of a machine in this context tight and accessible to everyone. Secondly, I picked drones because they represent technology that is synonymous with warfare and defence. This meant they presented a really great opportunity to explore how existing defence technology could be reimagined to wage peace instead of war (which is one of the themes of the exhibition). And so the challenge became: “How might we reimagine drones for peace?”. On the day I brought in a set of real drones to inspire people and get them thinking. Framing the design challenge is this way worked really well, the ideas that came out were surprising and highly innovative stemming from setting this challenge and making it easy for people to understand and engage. I started the session with an introduction to MOD., the exhibition and a bit about design thinking models. I also started with an apology. The apology was to participants for pace we were going to run with. I let them know upfront that it would be fast, timed and that we would keep to allocated tasks and then move on. Most importantly I stressed that they should have fun with it, not worry if they slipped behind (as there would be ways to catch up) and that we were attempting something tricky but that we would be doing it together. I’d seen a similar introduction given by the facilitators during the Sandford d.School Virtual Crash Course in Design Thinking – it was a critical step in making people feel at ease from the start. I created a slide deck that could also serve as the activity workbook so that people would have the exact same information in front of them as was on the screens. When designing this, I wanted a format that removed uncertainty and got people quickly into a rhythm that would help them keep up with the fast pace. We followed the Stanford d.School Design Thinking model for this challenge, not because it is my favourite model but because it is both the one that seems to be most often cited and the one that I think feels the least accessible due to the language it uses (the idea was that if you understood this one other, more simple models like the Double Diamond or IDEO’s are easier to grasp). I used colour coding to highlight each stage of the process starting with an introduction to that stage followed by a quick activity. The process repeated for each of the five design stages creating the rhythm I sought and removing ambiguity for participants. The activity was clearly sign-posted with a time-limit and Leanne Cotter, MOD. Program Coordinator, kept great time for me at the back of the room. This kept the process both to schedule and made it really easy for participants to both follow and engage with. I mentioned above that I provided scaffolding to people to ensure they could quickly catch up if they were left behind. I did this in a few ways. Peace is a term that is loaded and ambiguous. It conjures up images of everything from protest marches to meditation and is a really hard concept for people to digest and think about in a short amount of time. 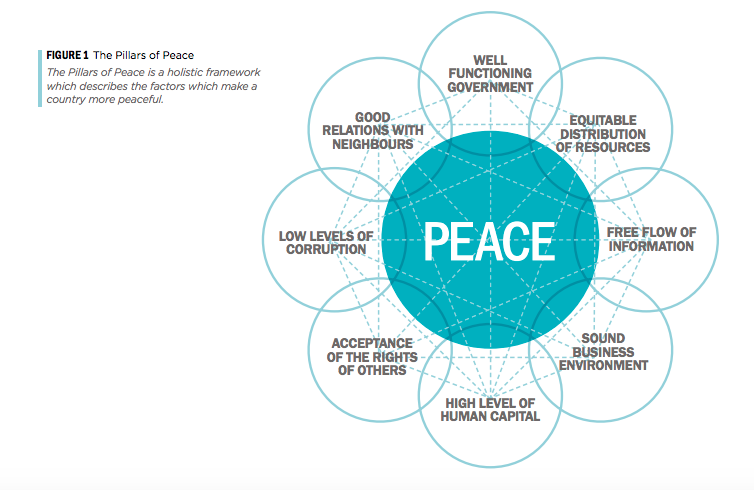 To make it easier, I used the Institute for Economics and Peace’s eight Pillars for Peace to frame ‘peace’ as a concept for this workshop and to provide participants with an objective view of factors contributing to peace based on real data. This removed any ambiguity about what peace was and helped everyone by limiting our focus to just eight things. I also offered the Pillars as a frame they could use in the classroom. At certain times during the exercises I gave participants the choice of coming up with their own ideas or using something I had prepared earlier. For example, when we worked on framing our challenge using ‘How might we…’ statements, I gave a list of eight statements that I had come up with ahead of time, linked to the Pillars of Peace, and offered participants the option of using one of mine or coming up with their own. 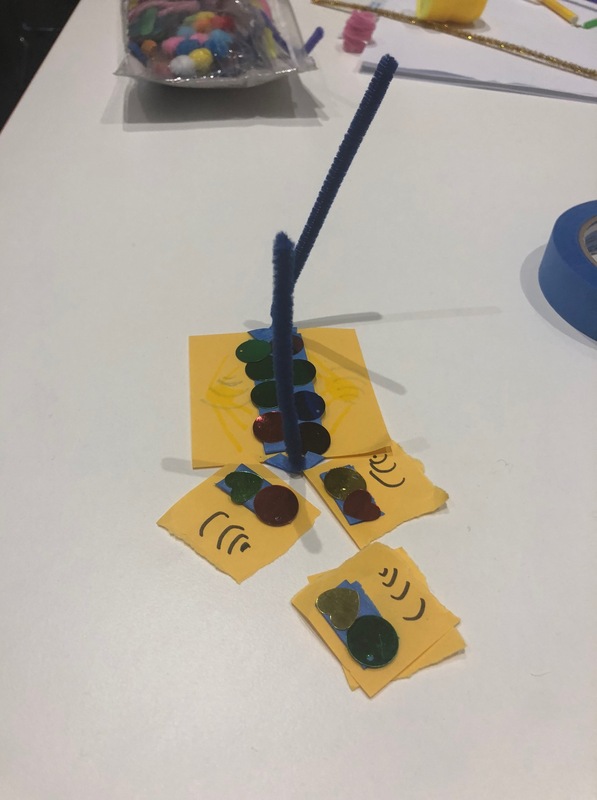 Similarly, at prototyping stage they were given the choice of using a range of prototyping materials on their desks to build something or drawing a simple story board (surprisingly most people chose the storyboard!). Throughout the workshop I used a consistent example to illustrate how each stage in the process could be applied. The example I picked was reimagining drones as a machine to enhance human rights. By using an example like this I was able to really quickly show how you can move from a broad theme to a specific design challenge and then onto ideation and prototyping ideas. As I was doing it myself in front of the group, and on the fly, it also helped to create a sense of being it in it together. This was really useful in making people feel comfortable about what each step entailed and what success could look like. 6. Don’t try and do everything! Despite the success of the workshop, an hour is never going to be enough to teach design thinking. I was really careful to select a single exercise for each stage that was achievable in the time we had – this meant that we left a lot out. The stage I feel most uncomfortable about is the first one – Empathise. For me it is the most important stage of the Design Thinking process, but it was impossible to do it justice in the time we had and with the theme we were working with. To get around this I encouraged participants to think about the gaps in their knowledge, who they were designing for and what conversations or insights they would seek in the real world. The workshop failed though in giving them tangible experience empathising with different lived experience and perspectives. Because the Empathise stage was tricky, testing it at the end was also hard. I settled on getting people to pair up and ask the person next to them ‘How can my design be made better?’ to engage in a quick conversation around improvements rather than what had been done well to give a taste of the iteration process. Again, the timing was too tight to do this justice. The bits that worked best were the activities that could produce tangible outcomes quickly: the ‘How might we…’ statements for the Define stage, the long list of ideas for the Ideation phase. Designs shared at the end included using drones to provide light for people to safely navigate spaces in developing countries, to distribute fresh fruit and vegetables to those in need and to provide universal, uncensored and anonymous access to the internet specifically for at risk groups like refugees. 100% who responded to the survey said they would recommend. This was my first attempt at facilitating a design thinking workshop in an hour. 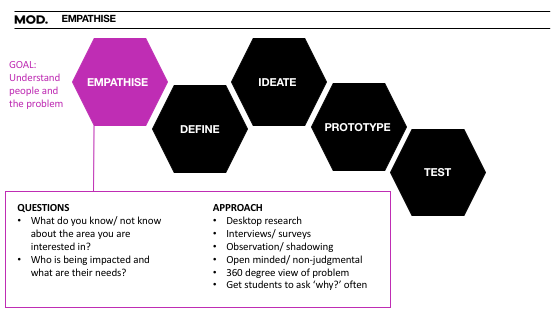 I learnt that it can be done – although it is still not my preferred way of teaching design thinking mainly because of what you are forced to leave out. I learnt that making things feel familiar, accessible and comfortable is really important and you need to establish this up front. That producing versions of ‘here’s one I prepared earlier’ is really useful when stuck for time and that keeping your design challenge tight will be really helpful. I also learnt that running a workshop in a room next to a train station has its challenges. You can read, watch and see more about both the project and workshop on the MOD. website. 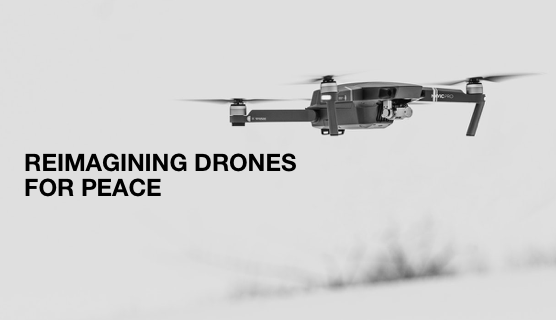 And, if you want to download my complete slide deck, I’ve uploaded it here: Crash course in Design Thinking – reimagining drones for peace.